The ultimate chess teaching and learning tool. Here comes lichess shared analysis! 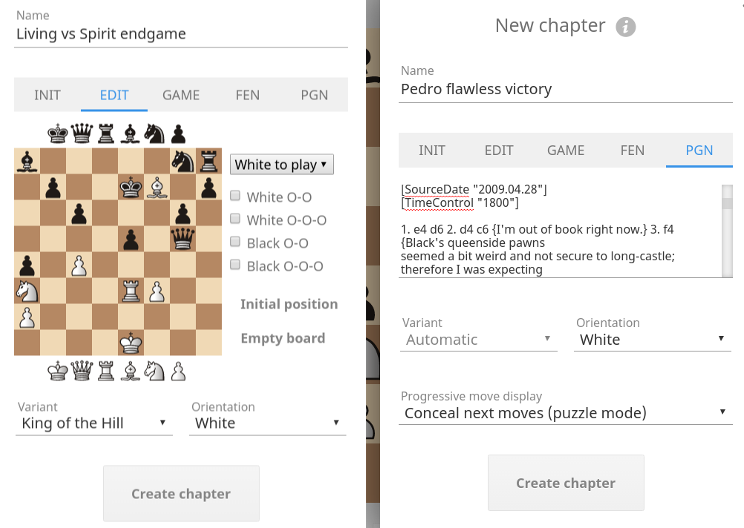 It's full-featured, it's free for all, it's gorgeous and fast and awesome; and in all modesty, it's the best thing that happened to chess since the invention of the smothered mate. We call it: Study. Moves, variations, comments, symbols, arrows: it's all saved on the server. Build chess knowledge that's here to stay. All studies are available from players profile pages. Invite friends to analyse that new trendy opening. Invite your coach to teach you something. Invite 20 students to your lesson. Why not? 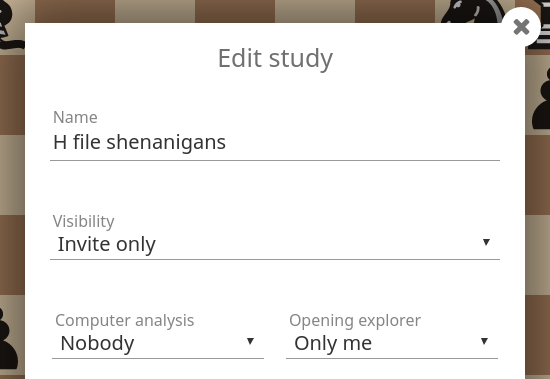 If your study is public, anyone can review it; invited members can chat, and invited contributors can update the study. If your study is private, only invited members can review it, and invited contributors can update the study. Wanna study another position? Don't lose all your work on the current position! Create a new chapter in the study, instead. INIT: start from the initial position. EDIT: Setup any position on a board editor. GAME: Load a lichess game replay. PGN: Paste a game replay. Variations and comments are preserved. It's even possible to hide the moves in a chapter, to make the other members guess them. Perfect for puzzle lessons. Crazyhouse, Chess960, King of the hill, Threecheck, Antichess, Atomic, Horde Chess, Racing Kings. Computer evaluation, opening explorer, endgame tablebase! There's so many features, it's ridiculous. Note that the study owner can decide to disable them. Anyone who can access a study can also download it, as a single PGN file containing all chapters with tags, comments, variations, and arrows. Naturally. In the ancient lichess tradition, studies are free, forever, and for everybody. Yeah... in most chess sites the word "free" is a trap. They say "it's free!" and then they hide the useful features behind a paywall. What a distasteful misuse of the beautiful word "free". We don't indulge in such half-truths. Lichess is free. All of it. And it's open source. But it must be so much work... how do you make a living out of it? I don't... but I would love to. If you want to help me work on lichess full time, and keep the great features flowing, please consider making a donation. If you can't, no worries. Enjoy the free stuff. We do it for chess!